On Sunday talk shows, the president's national security adviser and the U.S. ambassador to Russia talk tough on the alleged Kremlin-led effort to disrupt the 2016 U.S. presidential election. National Security Adviser John Bolton said on Sunday that the Department of Justice’s indictment of 12 Russian intelligence officers accused of meddling in the 2016 U.S. presidential election could “strengthen” President Donald Trump’s position in dealing with Russian President Vladimir Putin at their Monday meeting in Helsinki. The Justice Department on Friday announced that the 12 Russian military intelligence officers were indicted on charges of hacking into email accounts of the Democratic National Committee and Hillary Clinton’s presidential campaign, as part of an effort by the Kremlin to interfere in the 2016 U.S. presidential election. Jon Huntsman Jr., the U.S. ambassador to Russia, said on NBC’s “Meet the Press” that the indictments weren’t a surprise. He also warned of potential consequences if Russians attempt to interfere with the U.S. midterm elections this fall. On Saturday, the president criticized the administration of former President Barack Obama on Twitter for not doing enough to prevent hackers from accessing the emails. Democrats have criticized Trump for not more strongly rebuking Putin. Warner said he feared the Russian Federation leader will outfox the president in their meeting. 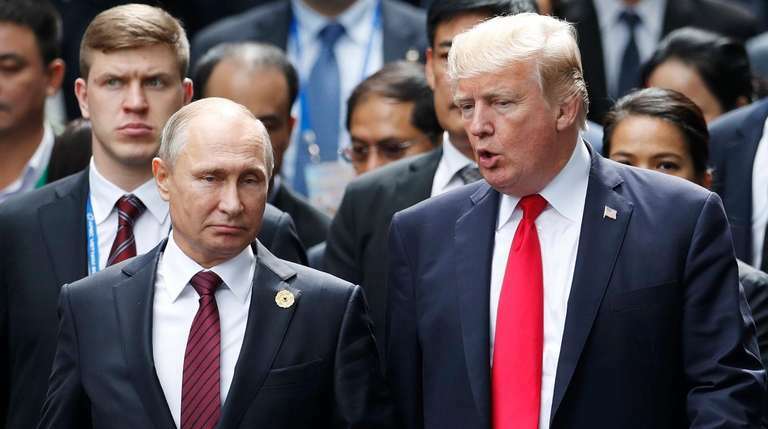 Editorial: Trump vitriol risks Western allianceThe contrast between Trump's increasing bellicosity toward America's allies and his sweeter talk about Russian President Vladimir Putin is disconcerting. Giuliani continues attack on Russia probe credibilityRudy Giuliani, President Donald Trump's personal attorney, said Sunday he does not believe Trump knew ... Trump tweets: End Mueller probe, collusion not a crime, moreSee President Trump's latest noteworthy tweets. Latest news: Trump presidencyGet the latest news on President Donald Trump and his administration.